The annual SIGCOMM Rising Star Award recognizes a young researcher who has made outstanding research contributions to the field of communication networks. Each year, ACM SIGCOMM will present a "Rising Star" Award, recognizing a young researcher - an individual no older than 35 - who has made outstanding research contributions to the field of communication networks during this early part of his or her career. Depth, impact, and novelty of the researcher's contributions will be key criteria upon which the Rising Star award committee will evaluate the nominees. Also of particular interest are strong research contributions made independently from the nominee's PhD advisor. Nominations for the SIGCOMM Rising Star Award are due November 1, 2012. Please see http://sigcomm.org/awards/sigcomm-rising-star-award for details on how to make a nomination. The SIGCOMM Executive Committee is inviting potential hosts of the SIGCOMM 2014 conference to submit proposals. Details of the proposal process are posted at http://www.sigcomm.org/conference-planning/sigcomm-planning/site-proposa... . Proposals should be submitted to Jaudelice de Oliveira, the Conference Coordinator, no later than October 31, 2012. Based on the three-year rotation schedule, the preference for 2014 is for proposals from North America. Professors often rely on textbooks to teach undergraduate and graduate networking courses. While there are many good introductory textbooks, there are very few books on advanced networking topics that could be suitable to advanced graduate courses in networking. To fill this gap, SIGCOMM Education Committee launches a community project to develop a high-quality, open-source, edited ebook on “Recent Advances in Networking”. This ebook will be distributed online via the SIGCOMM website and released under a creative commons license. The ebook developed within this project will be composed of chapters covering advanced networking topics and accompanying teaching material (slides, labs, exercises, …). All the source code of the ebook and the teaching material will on a version controlled repository that will be accessible for the entire SIGCOMM community. We expect that releasing such high quality teaching material will be beneficial for a large number of students and professors. The teaching material will be updated on a regular basis to reflect new advances in our field. In order to aid with synchronisation of activities and coverage of material, at the first stage, we wish to collect Expression of Interest (EoI) for proposed chapters in the ebook. These EOIs can either be surveys that provide a broad introduction to a subfield or detailed descriptions of new techniques/protocols/... An EoI should be an extended abstract of few pages that describes the proposed chapter and references experience in teaching this topic at a graduate level and references existing material (slides, references, …). The ebook chapters will have to be original unpublished material. Prospective authors are encouraged to contact the editors by email to check the suitability of material and the fit within the scope. The received EoI and the submitted chapters will be reviewed by members of the editorial board and external reviewers. "Tussle in cyberspace: defining tomorrow's internet", by David Clark, Karen Sollins, John Wroclawski and Bob Braden, Proc. ACM SIGCOMM 2002.
of high-performance routers, resulting in a major impact on the global Internet. SIGCOMM is ACM's forum for discussing communications and computer networks. SIGCOMM members include scientists, engineers, educators and students. They study all aspects of computer communications and networks: analysis, technical design, engineering, measurement and management. 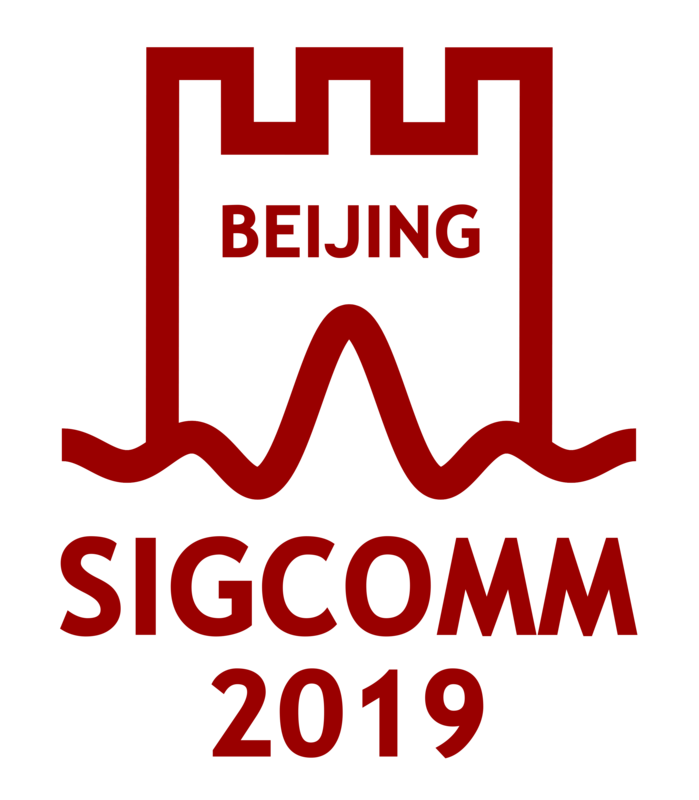 In recognition of the international nature of our field, and the resource constraints that can stifle the exchange of ideas, the SIGCOMM Executive Committee has set aside funds to support community projects that will contribute to advancing the field of communications and computer networks and cooperation within the SIG. Improving and maintaining software that is vital to the community. The SIGCOMM community uses research-enabling software that has often been developed by researchers or PhD students for specific projects, but is not actively maintained. A community project could focus on some widely used software (e.g., simulation tool, software library, measurement tool) and provide maintenance, documentation and support for this software so that it can be easily used by more researchers. Collecting datasets that are useful for the community. Many SIGCOMM researchers rely on datasets to evaluate the performance of proposed techniques or understand the behavior of protocols or applications. Many of these datasets have been collected by individual researchers and reside on researcher's homepages that disappear after a few years. A community project could collect some of these datasets, or create new ones, and provide the necessary metadata that details the dataset and its known limitations and store them on publicly accessible servers or add them to existing public collections. Understanding the SIGCOMM community and its evolution. Like many communities, the SIGCOMM community evolves. Although SIGCOMM members are skilled at measuring the Internet, we do not have quantitative data about the evolution of our community, e.g., the number of faculty, PhD students or researchers who consider themselves to be network researcher or the job opportunities for graduates. A community project could develop surveys like the Taulbee survey in the United States that could allow us to better understand who are SIGCOMM members and what are their needs. Educational material. Many SIGCOMM members develop various types of educational material for the courses they teach, such as slides, software, exercises, projects, or exams. This educational material is often of very good quality, but only used by one class at one university. An educational project could build on existing educational material and expand it so that it can be easily re-used by other teachers. SIGCOMM video channel. Tutorials have sometimes been offered in parallel with SIGCOMM conferences. Given the availability of video streaming platforms such as ACM's Digital Library, YouTube or Vimeo, it is now possible to widely disseminate presentations or long tutorials by using these platforms. However, this often requires a good quality video production. A community project could assemble a set of tutorials or long presentations, record them and disseminate the results to the entire SIGCOMM community. Training students by reproducing research results. There are regularly discussions about the reproducibility of research results generated within our community. Reproducing previous research results is important but reproducing some results, e.g., measurements or systems results, can take a lot of time. A community project could organize a summer school or a long workshop where students would reproduce previous but important research results. This activity could allow the community to verify whether some past assumptions that were based on old measurements are still valid. Database of networking courses. SIGCOMM members working in universities teach courses on a broad range of topics. Unfortunately, the teaching material developed for these courses is hidden on university web sites and difficult to find. A community project could categorize these courses and build a web site that presents all these courses in an easily accessible way. The next submission deadline in January 20th, 2013. The deadline for receipt of the project proposal is midnight, New York time. Proposals received on time will be acknowledged by email. The project must be relevant to and provide value to a large number of SIGCOMM members. The project must agree to disseminate its results to the community, e.g., via a poster presentation at one of the SIGCOMM-sponsored conference and/or an article in CCR. Furthermore, a brief report must be sent to the SIGCOMM EC at the end of the project. The funding must be for a single activity, although the activity can take place over a number of years. If the activity is the beginning of what will become an on-going event, the project must include a plan for obtaining continued funding from sources other than SIGCOMM. For events that span multiple years, funding may be only for the current year and funding for future years must be requested annually and cannot be guaranteed. The total budget requested from SIGCOMM cannot exceed 20,000 US$. SIGCOMM expects any overhead charged by universities or other organizations to be very low. People: Who speaks for, and take responsibility for this project? Who else is on the team? What are their qualifications to do this project? What is your expectation of success? Budget: What are the major costs for this project ? Schedule: When will the project start and end? Relevance: What SIGCOMM members are this project relevant to? Do they have similar projects already underway? How will they be involved? Potential value: What is the potential value of the proposed project to SIGCOMM members? Additional funding: Have you considered other sources of funding? Will someone match SIGCOMM funding? Previous work: What work has already been done in this area and how will this project build on it? ACM, with the support of several SIGs, is putting on a Turing Centenary event in June. Student scholarships are available to attend the event; see below for details. ACM SIGCOMM has a limited number of $1K scholarships to award to worthy students to attend the ACM Turing Centenary Celebration 15-16 June 2012 at the Palace Hotel in San Francisco, CA. $500 of the award must be used to cover 2 nights stay at the Palace Hotel. The remaining balance will go toward travel expenses. * Submission Deadline: 20 April 2012. * Notification of Awards: 30 April 2012. A nominee must be an ACM student member/member at the time of nomination. Note: Postdoctoral students are welcome to apply. 1. Name, address, phone number, and email address of the person making the nomination (the nominator). 2. Name, address, phone number, and email address of the candidate for whom the scholarship is recommended (the nominee). 3. A short statement (200-500 words) explaining why the nominee deserves the scholarship. The ACM CoNEXT conference (sponsored by SIGCOMM) is soliciting site proposals for its 2013 edition. together with some initial details on the overall organization,e.g., hotels, conference facilities, possible venues for the conference banquet, etc. Note that like several other SIGCOMM conferences CoNEXT rotates on a three years cycle between Europe, North America, and a "wildcard". CoNEXT 2010 was in Philadelphia, PA, the 2011 edition was held for the first time in Asia in Tokyo, Japan, and just ended after what was a very successful conference, and the 2012 conference will take place in Nice, France, next December. As result, we are now targeting a North American location for CoNEXT 2013. However, this is only a "target" and while preference will be given to proposals that conform to this target, strong proposals that don't will definitely be considered. If you are interested in submitting a site proposal, please check the instructions on the CoNEXT page http://www.sigcomm.org/events/conext-conference/site-proposals , and email me (guerin@ee.upenn.edu) your proposal before _*May 1st, 2012*_. We are expecting to finalize a site selection by May 31st, 2012. There is still plenty of time before the deadline, but proposals that are submitted early will be given greater consideration. S. Keshav has served admirably as CCR Editor now for close to 4 years, and the Executive Committee is pleased to report that we have recruited Dina Papagiannaki as his successor. Dina is well known to many in the community as a former SIGCOMM PC Chair and current member of the SIGCOMM Technical Steering Committee. We look forward to her taking the reins in September 2012 and continuing the fine editorial work that Keshav has done since 2008. Many thanks to Keshav, and congratulations to Dina. The SIGCOMM EC received three strong proposals for sites to host the annual flagship conference in 2013. The EC has selected Hong Kong as the site, with Dah-Ming Chiu (Chinese University of Hong Kong, China) and Jia Wang (AT&T Labs – Research, USA) being the general chairs. The conference will be in August 2013, with precise dates and more details to follow.